One of Central India’s lesser known reserves, Pench National Park is situated in the Seoni and Chhindwara districts of Madhya Pradesh. Dominated by hills, forests and valleys, this national park derives its name from the Pench River, which meanders its way through the entire stretch of the 757 km² park. The river runs from north to south, dividing the park into almost equal western and eastern halves the well forested areas of Chhindwara and Seoni districts respectively. It was declared a sanctuary in 1977 but raised to the status of national park in 1983. 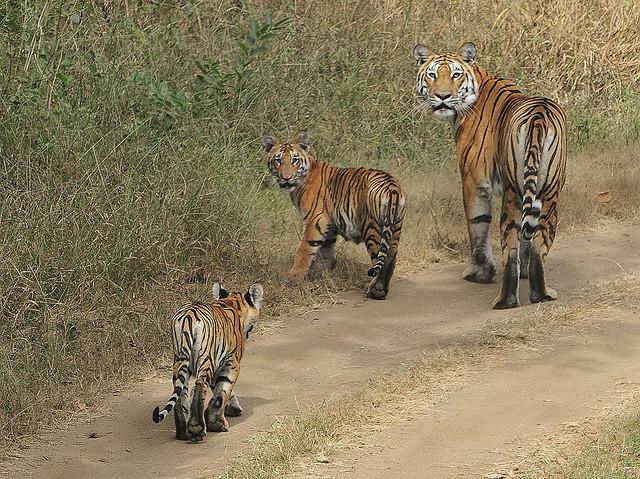 In 1992, it was established as a Tiger Reserve. The park is famous for rafting. In 2011 the park won the Best Management Award. This park is accessible from Pauni on National Highway 7 and has two famous gates as tourists entry, Turiya and Karmajhiri. Kala Pahar, the park’s highest hill, reaches 650 m above sea level. A typical Central Indian teak jungle, Pench supports a rich variety of wildlife, including the tiger, leopard, wild dog, gaur, sambar, chital and brilliant birdlife. The Park’s open habitat not only lends well to wildlife viewing, but it also offers striking views of the area’s sheer beauty. This national park received international recognition from Rudyard Kipling’s classic tale, the Jungle Book. 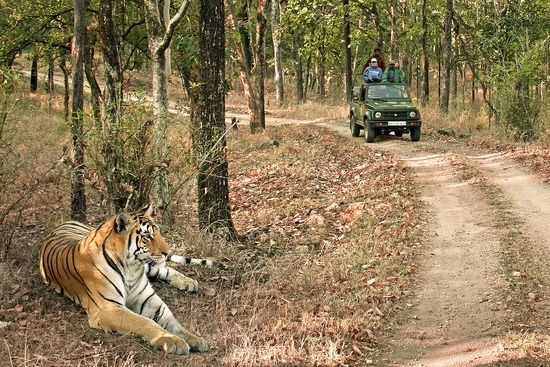 Indeed, the Pench National Park is four different forest regions in one, an extravagance of trees, shrubs, grasses, climbers, weeds and herbs, with teak being the most prominent of the tree species. The park is home to 33 species of mammals, 164 species of birds, 50 species of fish, 10 species of amphibians, 30 species of reptiles, and a wide variety of insect life. While primarily and reservation for tigers and panthers, the Bengal tiger is the main cat species of the park present in good numbers but sighted infrequently. 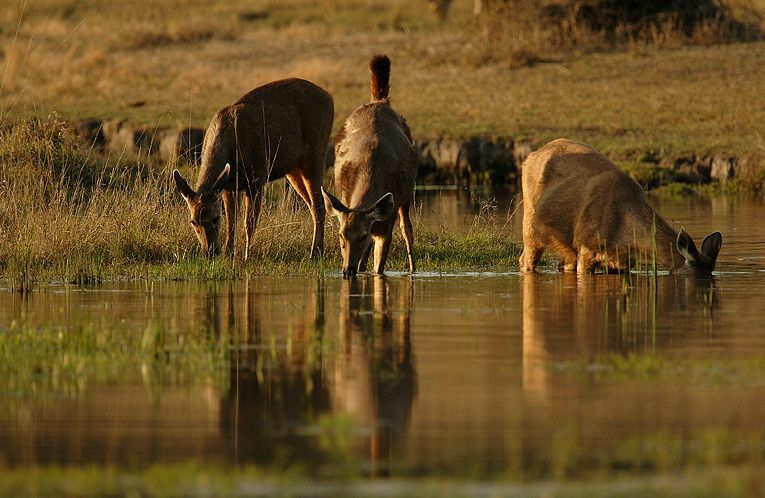 Pench is also home to sambhar, chital, barking deer, nilgai, black buck, gaur, wild boar, chausingha, sloth bears, wild dogs, langurs, monkeys, mouse deer, black-naped hares, jackals, foxes, hyenas, porcupines, and flying squirrels, to name a few. Here, birdlife is equally bountiful. The feathered denizens of Pench include both resident and migratory birds like Malabar pied hornbills, Indian pittas, ospreys, grey-headed fishing eagles, white-eyed buzzards, storks, waterfowls, four endangered vulture species, and the green pigeon, which is the State Bird. The best time to visit the park is between November and May. The Park is open to visitors between 6 am to 10:30 am and 3 pm to 6 pm. The park remains closed during the months of July, August and September. Nagpur airport (102 kms. from the Park) Nagpur is the nearest airport connected to Delhi & Mumbai and other places by regular flights. Jabalpur (192 kms.) also serves as a convenient airhead with regular flights from Delhi. Nagpur (102 kms.) is the nearest railway station connected to Delhi & Mumbai and other places in the region by regular trains. Jabalpur (192 kms.) also serves as a convenient railhead connected to Delhi and other parts of the country. Numerous Rajdhani Express Trains from Delhi conveniently connect to Nagpur like, the Delhi- Chennai, Delhi- Bangalore & Delhi- Bilaspur trains. 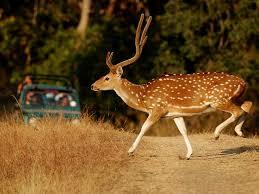 A National Highway connects the Pench National Park to Nagpur (102 kms.) and Jabalpur (192 kms). The drive time from Nagpur is 2 hrs and from Jabalpur, is 4 hrs. Turiya is the nearest highway stop near pench. Open jeep safaris are allowed from each of the gates twice in a day, with a fixed quota for each gate, for each schedule.